NECN is trouble shooting some of the problems caused by this winter's strong storms. 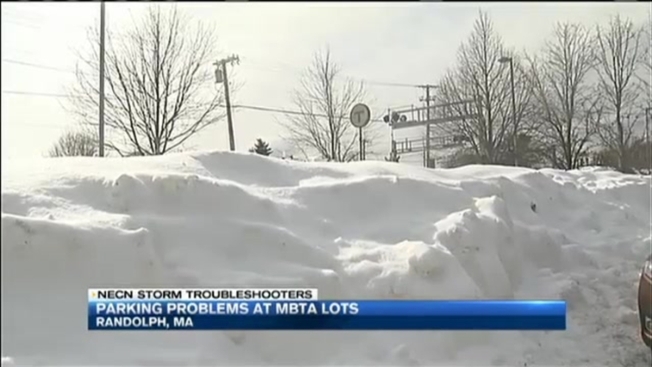 Many MBTA travelers have been asking about parking at lots where snow has been plowed, but not removed. They're having trouble parking to hop aboard a train. Commuters who can not see the snowed-over parking spot numbers are being hit with fines. It's causing headaches for MBTA passengers who park in the lots. NECN's Ally Donnelly went to MBTA stops in Randolph and Holbrook to hear the complaints of several commuters. Their main complaint being the snow is preventing them from clearly seeing the numbers of the spots they're parking in. Therefore, they are not paying the $4 fee at the "honor system" kiosk. As a result, they're being ticketed. Additionally, tickets have stemmed from the hulking snow piles that are forcing people to park anywhere and everywhere. The MBTA argues that they can't let people park haphazardly because it is a public safety issue, and that the tickets they are issuing are only "snow tickets." What that means is that they are fining people just $4, which is the same amount it costs to park there. The problem is right on the ticket. There is also a $1 surcharge and a $3.50 processing fee if you pay by phone or online. That said, one could end up paying as much as $8.50. The Snow removal company which tends to the lots said they are only authorized to remove snow if the MBTA gives them the go ahead. Long story short, the team told us they would have the private company, Laz, expedite snow removal at that lot.